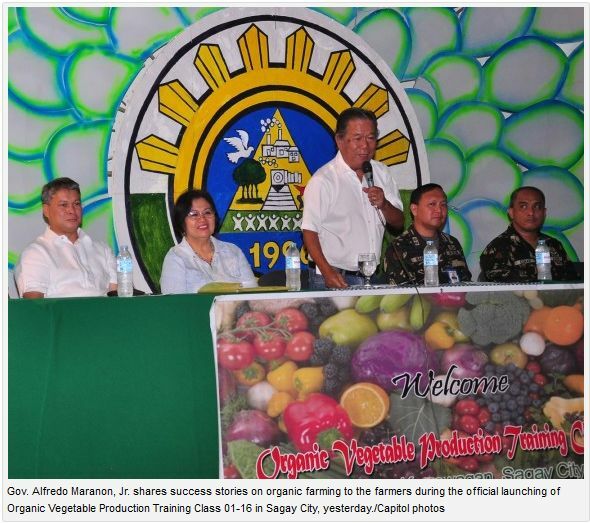 More than 200 farmers belonging to the Organic Vegetable Production Training Class 01-16 attended the official launching of their three-month training in Sagay City, Last January 26, 2016. The participants are marginal farmers, agrarian reform beneficiaries, and former rebels from the cities of Sagay, Cadiz and Escalante, and Municipality of Manapla. The program is being implemented by the Provincial Government through the Provincial Peace, Integration and Development Unit (Pro-PIDU) headed by Negros Occ. Provincial Planning and Development Coordinator and Pro-PIDU Action Officer, Dr. Ma. Lina P. Sanogal, and the 303rd Infantry Brigade and 62nd Infantry Brigade. Sanogal said that the main purpose of the program is to alleviate poverty, advocate organic farming, and promote lasting peace particularly in far-flung areas of Negros Occidental. The organic vegetable production Demo Farm, located at Herbal Garden, will serve as training venue to teach farmers on the proper way to grow organic vegetables. Sagay City Mayor Thirdy Marañon said that the said training will pave the way for the Negrenses to become suppliers of organic products, considering that there is an increasing demand of organic food worldwide. Attain a Yield of 170 cavans per Hectare!